A spinal fracture is a serious injury in which one or more vertebra in the spinal column collapse, causing the vertebra, which normally has a rectangular shape, to become compressed. It is typically caused by high-impact trauma, such as a car accident or long-distance fall, but can also be caused by osteoporosis in older individuals with weakened bones. The most common spinal fracture occurs in the thoracic (mid-back) and lumbar (lower back) spine or where the thoracic and lumbar connect (thoracolumbar junction). Thoracic or lumbar spine fractures affect men four times more often than women. The severity of the trauma that causes spinal fractures usually indicates the patient has additional injuries. What Are the Symptoms of Spinal Trauma/Fracture? Moderate to severe back pain is the main symptom of spinal trauma or fracture. This pain is worsened with movement. 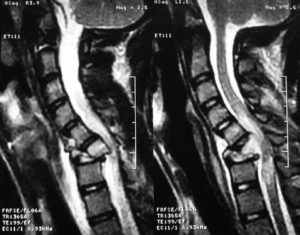 If the spinal cord is also injured, the patient may experience numbness, tingling, weakness or bowel/bladder complications. What Are the Causes of Spinal Trauma/Fracture? The primary cause of spinal fractures is high-impact trauma, such as a car accident, a long fall, a sports accident, or a gunshot wound. Other causes of spinal fractures include osteoporosis, tumors, or cancers that weaken the bones, making the vertebrae more susceptible to fracture during daily activities. There are three kinds of spinal fracture patterns: flexion, extension and rotation. Compression fracture: occurs when the bones of the spine (the vertebrae) break, most often caused by osteoporosis, trauma or tumors. Axial burst fracture: occurs when a vertebra breaks from high-energy trauma, such as a car accident or fall from height, causing parts of the vertebrae to shatter. These fractures are often regarded as more severe than compression fractures because of the long-term neurological damage that can result. Flexion/distraction (“chance”) fracture: also known as “seat belt injury,” this type of fracture occurs when the vertebrae is pulled apart, as in a head-on car accident in which the lower body is kept in place by a lap seat belt and the upper body is thrust forward. Transverse process fracture: caused by extreme rotation or sideways bending. Fracture-dislocation: occurs when a vertebra is displaced from an adjacent vertebra, often severely compressing the spinal cord. Before determining the best treatment, the physicians at Midwest Orthopaedics at Rush will consider if the patient has other injuries and the treatment of those injuries, as well as the particular fracture pattern. Physicians may suggest nonsurgical treatment as a viable option for flexion injuries, such as compression or burst fractures. In these cases, a brace worn for 6 to 12 weeks, combined with physical therapy exercises, can usually treat the fracture and prevent post injury complications. The physicians may determine where the spine fails and whether a brace or cast can be used to fit the bones together. A brace or cast may be used for 12 weeks if the extension fracture occurs only through the vertebrae and not into the discs of the spine. Gradually increasing motion may be a viable treatment for transverse process fractures. Dr. Singh may recommend the use of a back brace as well, depending on the patient’s pain and comfort level. Surgery may be required to treat a spinal fracture that is unstable, causes damage to the spinal cord or nerves, causes severe loss of vertebral height, or if the fracture extends through the spinal discs. The goal of surgery is to fit the bones together and safely remove any fragments compressing the spinal cord or nerves.